There are a couple of dealerships closer to me, but the customer service that I have received at Shelor Motor Mile is always worth the drive. I am always satisfied with the repair work done. Kristopher Roop made buying a car easy and painless. He was very knowledgeable and took the time to explain everything about my new car. I highly recommend people looking for a car to see Mr. Roop. I will be a return customer. I've bought eleven vehicles from this dealership, they are my go to. It really is a mile of Shelor branded car dealerships and repair services anchored by this welcome center. The service department was very courteous and took care of my needs. I spent 31 years in public service in Pulaski County and I can remember being in a business where the employees went out of their way to make you feel welcomed. That was my experience today as I visited the Quick Lane service center in Pulaski. Ray McClanahan at the Service Center was on top of his game getting my needs taken care of and out in a very timely manner. I would strongly suggest, if you need vehicle repair, inspection or looking for a new vehicle, give Pulaski Motor Mile a chance to earn your business. You won't be disappointed. Very prompt service. They got to me before I could get out of my car. After my car was done I didnt even wait one minute before they got to me again. Very pleasant service advisor. Everything was as smooth as silk with the purchase of my new Toyota truck. John was patient and kind and very helpful. Seriously the easiest buying process ever! We are so happy with our new car!! Staff was kind and curtious, service was top notch. Are you looking to get behind the wheel of a high-quality and reliable new or used car? Here at Shelor Motor Mile, we enjoy delivering exceptional customer service to residents in the Christiansburg-area. All in one convenient location, you can check out our huge selection of Toyota, Kia, Chrysler, Dodge, Jeep Ram, Chevrolet, Ford, Subaru and Mitsubishi vehicles. We typically sell about 1000 cars a month and we enjoy working with our community. We are locally-owned and we’ve passionately served area car shoppers since 1974. 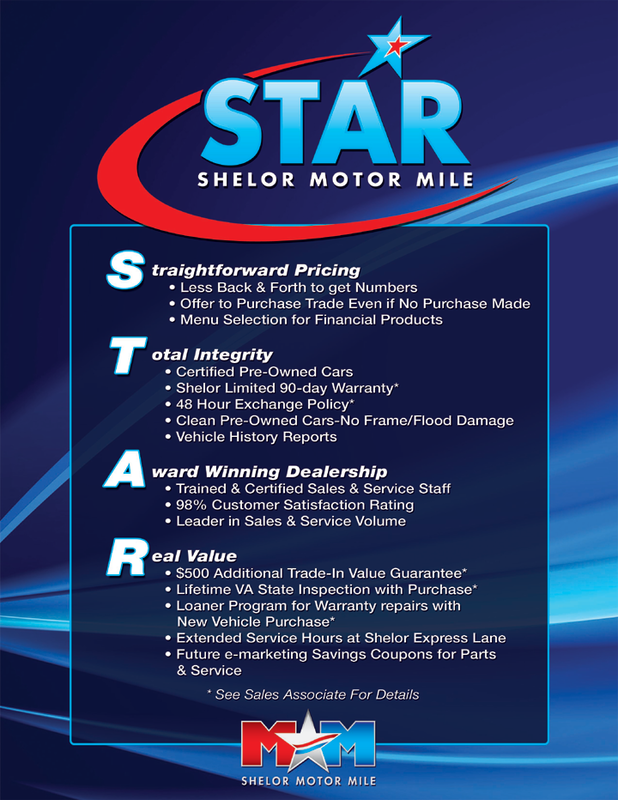 We’re confident you’ll enjoy our STAR Program, which includes Straightforward Pricing, Total Integrity, Award Winning Dealership and Real Value. Shelor Motor Mile. Why start anywhere else? While we call Christiansburg home, we serve people from all over Virginia, including Blacksburg, Radford, Salem, Roanoke, Pulaski and Wytheville, as well as communities in West Virginia. Also, we are conveniently located between Virginia Tech and Radford universities. Whether your vehicle search leads you to Toyota, Kia, Chrysler, Dodge, Jeep Ram, Chevrolet, Ford, Subaru or Mitsubishi, our inventory has the right car for you. Come visit us at Shelor Motor Mile. It’s worth the drive!